Established in 1993, Tripod Crest Planing has developed exceptional in-house expertise and a reputation for unrivalled quality and customer service. 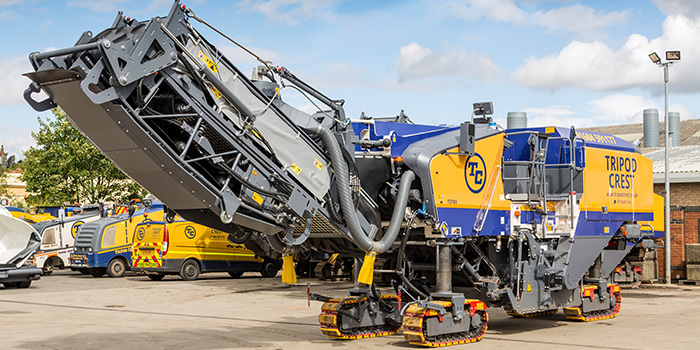 Our core strengths lie in our people and plant and we are able to call upon the UK’s most experienced road planing team and largest machinery fleet. With highly skilled operators based across the UK, we are also perfectly positioned to offer a comprehensive, nationwide solution. In addition, our fleet encompasses 32 road planers from the compact W350 up to a 2m machine. Workshop facilities, low loaders, bowsers and a selection of additional ancillary equipment are also available. Furthermore, we have the know-how to undertake road planing projects of any size, from the simplest small hire works through to major Highways England contracts and airfields. Tripod Crest is a quality assured organisation and we deliver unparalleled on-site supervision and experience as standard for each and every assignment. We were founder members of the respected Federation of Planing Contractors (FPC) and were one of the very first companies to be awarded the SafePlane Charter.